Thread: Decision time - which Lelit? Being a methodical type, i've spent a bit of time over a period of months trying to decide on what type of machine to buy. its a 1-2 coffees a day usage, generally a flat white for me (work from home) and a macchiato for my partner (if he's around). I have had an espresso machine before but it (old pavoni) was pretty simple and no idea of its specs. I decided that a SB should be sufficient but ruled out the gaggia/silvia due to lack of PID and lots of comments that there are much better machines available now for hte price. Came across the Lelit PL41 then found out its not PID'd. Decided also to look at HX machines second hand on our local auction site but.....here's where it gets difficult. It appears that people in Christchurch (where i have recently moved to, a sizable city where coffee seems to be veeeeeery milky) either buy super expensive machines (e.g. Profitec - seen in shop but never seen 2nd hand) or prosumer machines which I am not interested in contributing to our landfill. 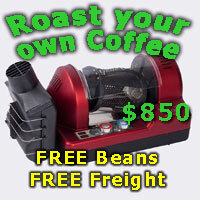 Decent used machines are few and far between - a few rancilio silvias at really inflated prices (e.g. 8 yr old machine for $600 when i can buy new for 950NZ) is about it. A user did point me to one in Auckland recently but was nervous at handing over all that cash sight (and shot) unseen, and it sold while i dithered (Fioranatta or something). Also, most people are not keen to freight a heavy machine. 1. PL41LEM $1099 (NZ) - note NZD = about 0.9 AUD. They also offer this with a Lelit Pl0443 grinder for $1199. 2. PL41TEM - open box for $999. These are new machines that had faulty components or returns. The parts have been changed and the machines tested. The machines are new, but might have made 1-2 coffees for testing. I'd buy a grinder separately for this, but probably second hand (these freight OK and seem to be more available locally, strangely). Is the TEM really that much better? As i've said we don't have options such as the CC1 which i've seen mentioned alot. Other SB options in hte under $1500 range seem to be Ascaso, pavoni, which don't have PID.